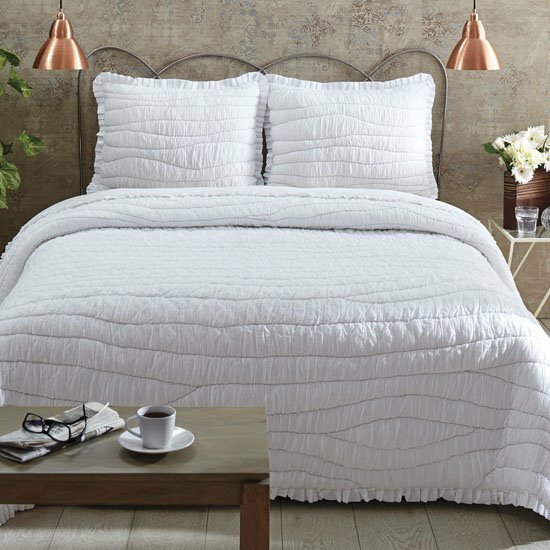 Aurora quilt and shams in white by VHC Brands | P.C. Fallon Co. Perfectly on-trend with its textural appeal, Aurora is lovely alone or layered with other prints or colors. Single Fabric; Machine stitched, Hand-quilted; Machine stitching and hand-quilting creates ruching effect on soft marshmallow cotton voile fabric; Grey taupe quilting and stitching creates an elegant wave-like appearance; Trimmed with 1.5" marshmallow pleated ruffle; Reverses to solid marshmallow cotton voile fabric. Quilts available in queen, king and luxury king size. Standard and king size shams are offered ; Imported; 100% Cotton Shell; 100% polyester batting; Hand wash separately in cold water. Do not wring. Lay flat to dry, out of direct sunlight. No chlorine bleach. Do not iron or tumble dry. From VHC Brands - Ashton & Willow.